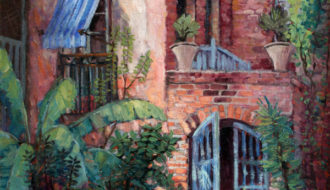 Impressionist painter Colette Pope Heldner lived with her husband, artist Knute Heldner, in the French Quarter, where she found the courtyards and architecture to be favorite subjects. One of the more colorful members of the bohemian art colony centered in New Orleans’ French Quarter from the 1920s through the 1940s, Colette Pope Heldner was devoted to her husband, Knute Heldner, a nationally famous artist and her one-time art teacher, but forged an artistic career of her own when she was widowed. After Knute’s death in 1952, the fiery redheaded Colette, who was twenty-five years her husband’s junior, was heard to say, “I am the only artist in the family!” Reveling in her newly found artistic freedom, Heldner redefined traditional French Quarter scenes and landscape compositions with a bold new expressionism that utilized bright, garish color and a distortion of form. Dorothy Colette Pope was born in Waupaca, Wisconsin, on May 18, 1902 to Guy W. and Libbie E. Pope. After her father’s death, Pope’s mother moved the family to Duluth, Minnesota, where she supported her children by operating a tobacco and newsstand in the lobby of a hotel. Independent and strong-willed, Colette left home at the age of fourteen, bobbed her hair, and—because of her small, slight stature—was able to gain employment as a Western Union delivery “boy.” The disguise did not fool her mother, however, who recognized her daughter during a delivery to the hotel and had the authorities apprehend her and bring her home. Heldner used this resourceful, independent spirit to pursue her artistic interests. She took art lessons at the small Rachel McFadden Art Studio in Duluth while working as McFadden’s secretary. There she met her future husband, Knute Heldner, who had been hired to give art lessons and demonstrations for the public in the display window of the studio. Knute, then forty-five years of age and an accomplished artist, presented a romantic figure, a tall Swede with a reddish-gold beard. The couple eloped in 1923 and traveled to New Orleans that winter to escape the harsh Minnesota climate. The French Quarter captivated the newlywed Heldners. Colette described it as “compelling, completely fascinating, narrow streets, balconies, plants, clotheslines by the galleries, dirty-faced Italian babies, perfect Murillo models—vile odors on the one—and exquisite perfumes on the other….” The old colonial-era neighborhood was an inspiration, a wealth of material for the artist to absorb and draw. This cacophony of senses aptly informs her art. Her early work depicting French Quarter courtyards and street scenes closely resembles her husband’s, with painterly but realistic well-drawn compositions. 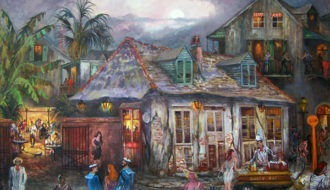 Popular sights such as Pirate’s Alley, the Brulatour Courtyard, and the Little Theater are enlivened with broad splashes of color and the occasional picturesque figure, a Dominican nun in a billowing habit or a Creole lady with her bright tignon and market basket. 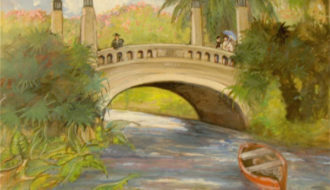 Between 1929 and 1932, Colette and Knute traveled to Europe on his scholarship, provided by the city of Duluth, and the prize money he won from the 1929 Chicago Art Show. This trip introduced new themes as well as a new style in her work. European scenes, particularly those of the Latin Quarter in Paris, were drawn in sketchy, black outlines on a more painterly impressionist background. Colette’s images of Paris are filled with abundant and humorous anecdotal detail: boisterous café clientele, fashionable women walking poodles, and sailors ogling brazen streetwalkers, all drawn as caricatures. On her return to New Orleans, Heldner adapted this new style to depict French Quarter life, which she likened to the Latin Quarter. She also changed her signature to read simply “Colette” instead of “Colette Pope Heldner,” perhaps in imitation of the daring French writer Colette. On their return to the United States, it was the Heldners’s custom to travel between Duluth, Minnesota, in the summer and New Orleans in the winter. Both reinvented the Louisiana bayou scene, which had been current in the late nineteenth century in the work of Richard Clague, Joseph Rusling Meeker, and William Henry Buck. That generation of Louisiana landscape painters favored realistic scenes with precise drawings, natural colors, and usually a pervasive brown tonality. The Heldners, in contrast, created a popular modern view, which did not rely on fidelity to nature. 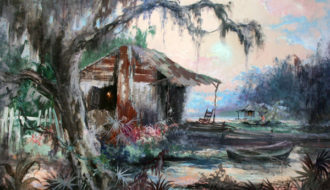 Instead, their paintings were structured using stock compositional elements: live oak or cypress trees, picturesque rundown shacks, rickety docks, pirogues, and fishermen, which varied according to the artist’s inner vision. The compositions were more casually organized with impressionist brushstrokes in rich saturated color. 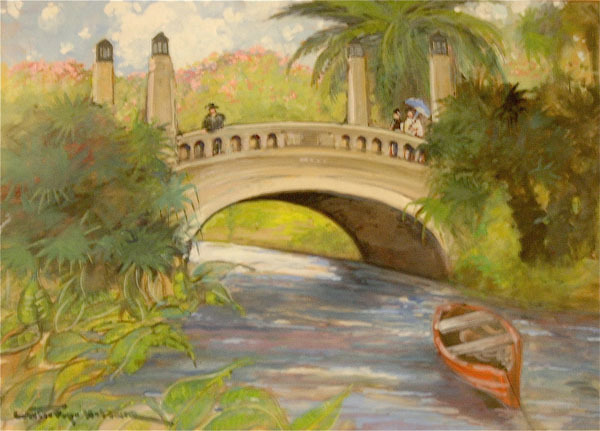 After Knute’s death in 1952, Colette devoted herself to painting more fantastical bayou scenes, which she termed “swamp idylls,” to meet an overwhelming demand. She experimented with different palettes, from boudoir pastels popular in the 1960s and early 1970s to hot garish colors. Her expressionist palette suggests the mood of the sultry, fevered tropical climate. She indulged in an exceptionally loose treatment of form, swiftly executed with brushstrokes as untamed as the bayous they portrayed. 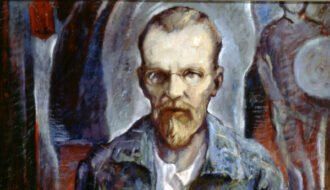 In the final years of her life, Heldner was especially fearful of artists who might copy her work. She had many imitators in her adopted city of New Orleans both during her lifetime and after her death. Her art peaked during the resurgent interest in Cajun culture in the 1970s and 1980s. 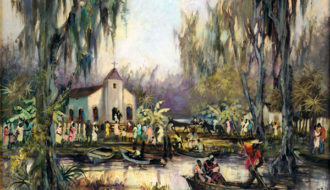 Heldner received renewed critical acclaim following her death in New Orleans on May 3, 1990, with retrospective exhibitions such as In a New Light: America’s Brush with Impressionism, held at the Morris Museum of Art in Augusta, Georgia, in 2005. Her art can be found in the Ogden Museum of Southern Art in New Orleans and the Louisiana State University Museum of Art in Baton Rouge. Saward, Susan "Colette Pope Heldner." 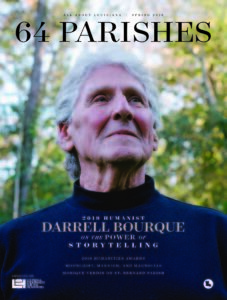 In https://64parishes.org Encyclopedia of Louisiana, edited by David Johnson. Louisiana Endowment for the Humanities, 2010–. Article published September 12, 2012. https://64parishes.org/entry/colette-pope-heldner. Coen, Rena Neumann. Minnesota Impressionists. Afton, MN: Afton Historical Society Press, 1996. Knute Heldner and the Art Colony in Old New Orleans. New Orleans: Jean Bragg Gallery, 2000.